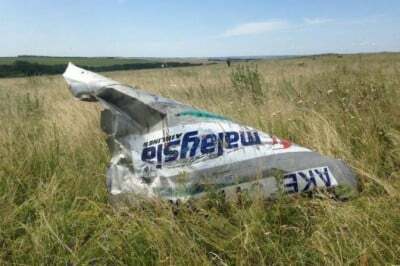 The Malaysian passenger plane MH17 may have been shot down July 17 by a Ukrainian anti-aircraft unit during an exercise, according to Russia’s Ria Novosti, which cited an anonymous source in the Ukrainian security apparatus. The new and detailed allegations in the Russian media come amid mounting US and European Union charges that Russia is responsible for the shooting down of the jetliner. Two SU-25 fighter jets from the airbase of the 229th Brigade of the Kulbakino tactical force in Nikolayev reportedly served as control targets. One of these aircraft had been recorded near Sarostschenskoje by a Buk anti-aircraft missile system. “The tragic accident could have led to the flight route of the Malaysian Boeing and the SU-25, which were at different altitudes, crossing and appearing on the radar display as one large point, which was fatal for the civilian plane, because the targeting system would automatically choose the larger target,” the source told Ria Novosti. A rocket launch was reportedly not scheduled. Why a rocket was nevertheless fired, the source could not explain. “This is the question facing Ukrainian Security Service staff, who picked up the battery commander and crew at about half past nine in the evening,” he said. The Ukrainian side immediately rejected this information as false. “This information that the Boeing was shot during an air defence exercise is absolute nonsense,” a Ukrainian defence ministry spokesman said. The Russian defence ministry already provided precise information on Monday, however, including about the presence of a Ukrainian SU-25 fighter jet in the vicinity of the Malaysian Boeing jet at the time of the crash. At the press conference, Lieutenant General Andrei Kartopolov said the SU-25 would have been in a position to destroy the Malaysian Boeing with a missile. He also showed satellite images of Ukrainian Buk batteries, which were located in the vicinity of the disputed region, and of increased electronic activity reported by radar stations at the time of the crash, transmitting target information to the Buk batteries. The Ria Novosti report supports this claim. Although it remains completely unclear who shot down the Malaysian passenger aircraft, and evidence pointing to Ukrainian involvement is mounting, Washington, Berlin and the European Union are systematically exploiting the air disaster to intensify their reckless offensive against Russia. Harsher sanctions threaten to plunge the Russian, European and world economy into a new crisis. The dispatch of armed units into the area of the catastrophe, as the Dutch and Australians are seeking with a UN resolution, carries the risk of military escalation that could culminate in a nuclear confrontation with Russia. The Western powers are relying on an unpredictable right-wing regime in Kiev, which regards an escalation of the war as the only way to cling to power. This became clear on Thursday when Prime Minister Arseniy Yatsenyuk resigned from office. Yatsenyuk resigned after several economic laws had failed to pass in parliament. These included a law enabling the partial sale of the country’s gas transportation system to foreign investors, providing urgently needed money for the state coffers. Beforehand, the Udar party of the Kiev mayor and former professional boxer Vitali Klitschko, as well as the fascist Svoboda party, left the governing coalition with Yatsenyuk’s Fatherland Party. Following Yatsenyuk’s resignation, Poroshenko named a close confidante as acting prime minister, the 36 year-old Vladimir Groisman. Yatsenyuk, a banker who for a time headed the Ukrainian National Bank, fears state bankruptcy if the government’s work is blocked by elections. The Ukrainian economy is in free fall. This year it will shrink by between five and seven percent. Company order books are empty, international investors are pulling out, and Russia stopped gas deliveries in June. Among other things, Yatsenyuk had planned to bring in €2.3 billion through tax hikes and cuts in subsidies, in order to finance the military intervention in eastern Ukraine. The billionaire oligarch Poroshenko hopes, however, that he can expand his power base in parliamentary elections that will take place in the exceptional situation of a civil war and a sharp confrontation with Russia. For this reason, he is pushing through a brutal offensive against the cities of Donetsk and Luhansk, which he did not interrupt after the crash of the Malaysian passenger plane to allow the recovery of the bodies and securing of the crash site. Largely unreported by the Western media, the Ukrainian army has been bombarding densely populated areas with artillery and aircraft. On Thursday, Human Rights Watch published a report documenting four cases between July 12 and 21 in which the Ukrainian military attacked civilians with Grad rockets. These rockets—known as Stalin’s Organs in the Second World War—are uncontrolled and cause enormous damage when deployed against residential areas. At least 16 people have died in the cases documented. Human Rights Watch accused the Ukrainian military of breaching international human rights, which could be treated as a war crime. The fascists of Svoboda have taken on the job of intimidating internal political opponents of Poroshenko. They justify their support for new elections—which they had previously opposed, fearing a loss of votes—saying that a parliament in which “state criminals” and “agents of Moscow” sit should no longer exist. By “criminals” and “agents” they mean the Party of the Regions of ousted President Viktor Yanukovych and the Communist Party, which received 30 and 13 percent of the vote respectively in the last parliamentary election, held two years ago. The chairman of the Communist Party was beaten up by a Svoboda parliamentary deputy after he demanded an end to the military operation in eastern Ukraine. He was subsequently ejected from the chamber by the parliamentary president. The party’s parliamentary faction status was then removed, and there are demands that it be banned. The new parliamentary elections, set for October 2, recall the Reichstag election under Hitler in March 1933 and the Egyptian presidential election in May 2014—held under conditions of emergency rule and the suppression of the opposition.